San Diego County Sheriff’s Department cruiser. A 26-year-old man was arrested Wednesday and booked into jail on suspicion of first-degree murder in connection with the stabbing death of a man inside his condominium south of Lake Jennings in unincorporated El Cajon. Few details of the killing were immediately available, but San Diego County Sheriff’s Department officials Wednesday morning announced the arrest of Dylan Edward Poston in the Tuesday night stabbing that left a man dead and his wife injured. 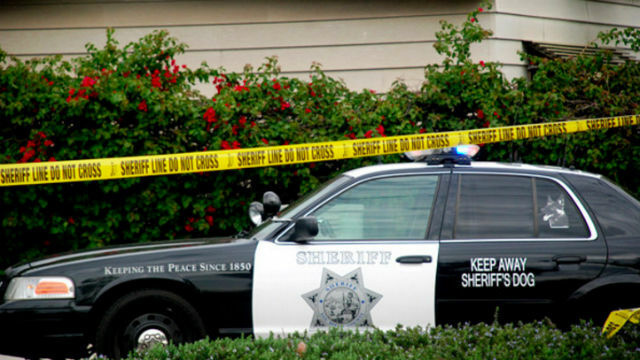 The victim’s wife called 911 just after 10:30 p.m. to report that her husband had been assaulted inside the couple’s condo at 13806 Pinkard Way and was not breathing, sheriff’s Lt. Rich Williams said. The wife also suffered stab wounds that were less serious than her husband’s ultimately fatal wounds. Reports from the scene indicated the wife was injured while trying break up a fight between her husband and Poston. The couple’s child was in the home at the time but was not physically harmed. Lakeside Fire Department personnel from Station 3, located about 100 yards away from the complex on an Interstate 8 frontage road, treated the victim and took him to a local hospital, where he later died, Williams said. His name was not immediately released. Poston was being held without bail at the San Diego Central Jail. His relationship, if any, to the victims was unclear. Sheriff’s homicide detectives took charge of the stabbing investigation and obtained a search warrant in order to scour the apartment for evidence, Williams said. Anyone with information about the slaying was asked to call the sheriff’s homicide detail at (858) 974-2321, or San Diego County Crime Stoppers’ anonymous tip line at (888) 580-8477.